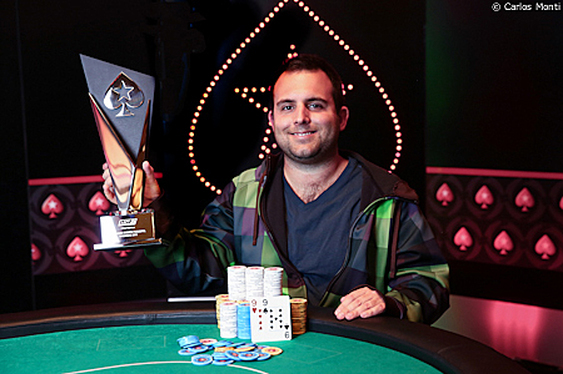 American pro Josh Kay is usually found grinding the cash tables but showed his tournament props on Friday after taking down the maiden $3k LAPT Bahamas Main Event. The man from Michigan pocketed a career best tournament score of $367,928 after topping an impressive turnout of 736 runners in a tournament which proved an ideal appetiser for the PCA Main Event. Eleven players started Friday's finale with Kay out in front but it looked like Martin Finger would once again steal the glory. The German has been in great form of late winning the EPT Prague Main Event and the EPT London Super High Roller titles. It appeared that Finger was going to make it a hat-trick of big wins after knocking out all but one of his final table rivals. Despite heading into heads up play with a hefty deificit, Kay would not be denied though, chipping up early on when his flopped straight held against Finger's flopped two pair. A flopped flush on the very next hand put him further in control and it would soon be over after another great flop for the American. The chips went in with just the last card to come on an 8c9c5h10h board with Kay in front holding a set of nines. Finger still had outs though with Qd10d . The Qc on the river gave Finger top two but that wasn't enough to stop Kay taking the title. And what did the cash game reg tweet after claiming his big score? Image courtesy of Carlos Monti @ PokerStars.